Announcement loops are a great pre- or post-service communication tool. 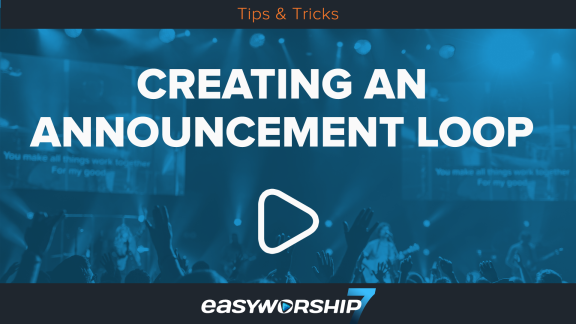 Whether you're sending announcements to a lobby kiosk or presenting on the main screens in your auditorium, this article will show you how to get started. Slide loops are created in the Presentations Area of EasyWorship. When you're ready to play the loop, simply drag-and-drop it to the Schedule Area and click Go Live, or just double-click it to send it to the screen. The slides within the Presentation will loop until you go live with the next item in the Schedule. Create a new presentation (click the Presentations tab in the Resource Area and click the Add icon). 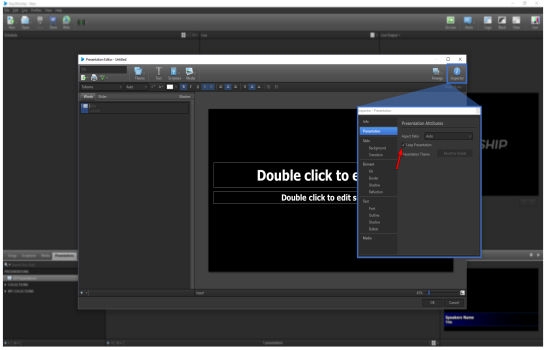 OR right-click an existing presentation and select the option to Edit Presentation or New Presentation. 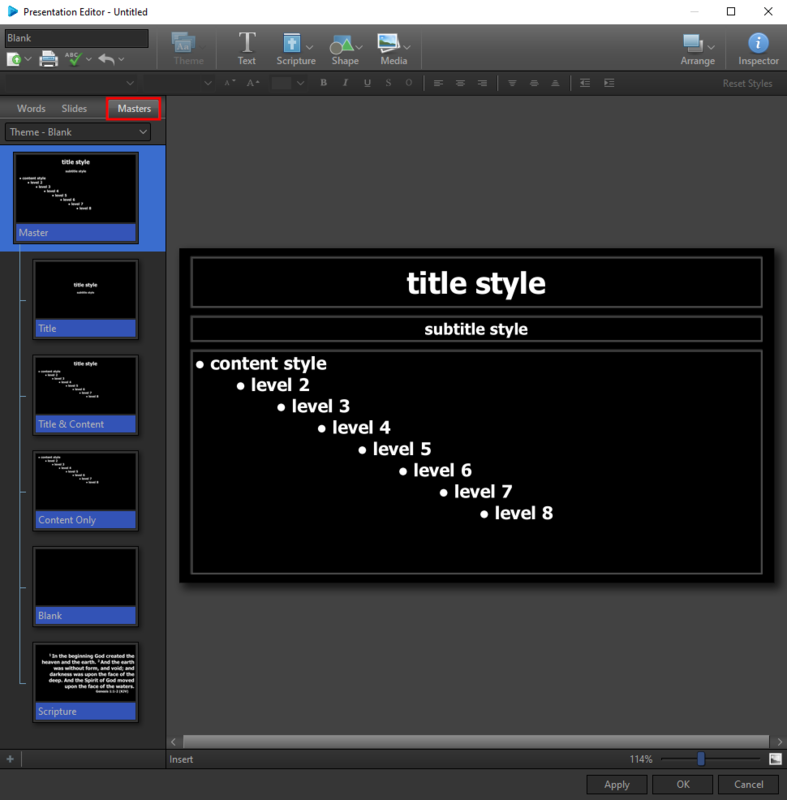 Once the Presentation Editor opens, click Inspector in the top-right corner. Click Presentation on the left and check the box to Loop Presentation. Select the Masters tab in the Presentation Editor. Select the Master Slide (first slide at the top). 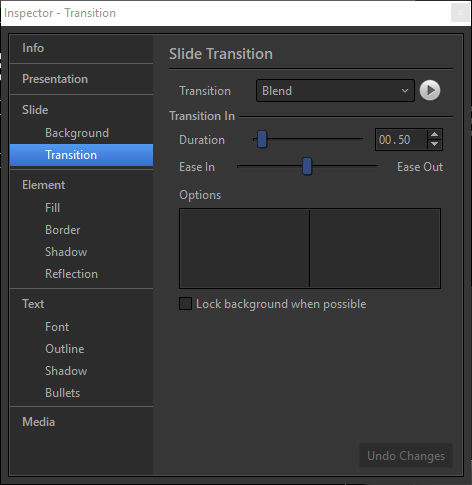 In the Inspector, select Transition under the Slide settings. Set the transition and any other desired options. On Click advances the slide when you click the mouse. Automatically advances the slide automatically after the set time. Delayed advances the slide when the media on the slide has finished playing. Loop Slide - Set the slide to loop continuously until you select another slide. Always start slide from beginning - Set the slide to always play all elements from the beginning. All slides will be updated by this change. If you want to modify the time for a specific slide, select that slide from the Words or Slides tabs and use the Inspector to change the timing. You can also change these settings for the different individual slide themes from the Masters tab. Instead of selecting the Master slide at the top left, you can select Title, Title & Content, Content Only, Blank or Scripture slide. Add as many slides as desired. Then, enter a name for the presentation in the Title field and click OK to save. NOTE These instructions apply only to EasyWorship presentations, songs, and scriptures. PowerPoint loops cannot be set up using these instructions.